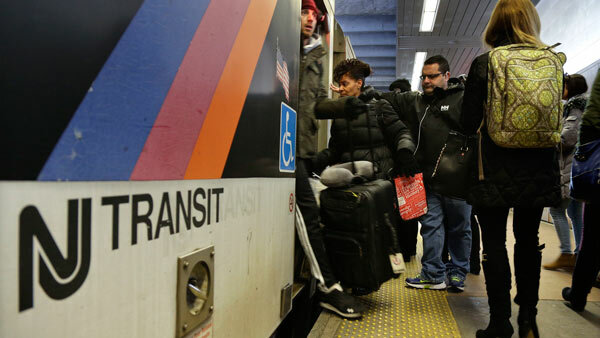 NEWARK, N.J. (WPVI) -- NJ TRANSIT says it has suspended further ticket sales for the Atlantic City Rail Line (ACRL) due to high volume of ticket purchases in advance of the Eagles Super Bowl victory parade in Philadelphia on Thursday. The ACRL ticket sales suspension applies to all travel between Atlantic City and 30th Street in Philadelphia including all intermediate stations. All customers will need pre-purchased tickets to board the ACRL for the entire service day on Thursday. -Limited additional capacity will be added to select existing Atlantic City Rail Line trains. -An extra train will operate between Atlantic City and Philadelphia 30th St. station, departing Atlantic City at 8:26 a.m. and arriving in Philadelphia at 10:05 a.m.
-An extra train will depart Philadelphia at 4:19 p.m., arriving in Atlantic City at 6:12 p.m.
-Prior to 8:00 a.m., all Philadelphia bus routes will operate regular routing. All a.m. service on the 414/417/555 routes will go to 30th St. station as scheduled. -From 8:00 a.m. - 7:00 p.m., all Philadelphia bus service will be adjusted due to street closures and will make a single stop in Center City Philadelphia at 6th/Race St. While this adjusted service is operating, customers should plan to be at 6th/Race St. at the arrival times shown on the timetable. -Customers riding Greyhound Terminal routes (313/315/317/551) must go to 6th/Race St. at the normal Greyhound departure time shown on the timetable. -During p.m. peak period, routes 414/417/555 will NOT board at 30th Street Station. Customers must go to the 6th/Race stop and use the existing Market/7th Streets departure time shown on their timetable for guidance. -After 7:00 p.m., all Philadelphia service will be restored to regular routing. -River LINE service will operate trains between Trenton and the Walter Rand Transportation Center (WRTC) in Camden and an additional train will provide service connecting the Waterfront Entertainment Center and WRTC. -River LINE will maintain 15-minute peak period service throughout the mid-day hours and additional capacity will be added throughout the day. -Access Link will cancel all trips to and from Philadelphia. Important Note: NJ TRANSIT is prohibiting all beverages on all trains and buses to and from Philadelphia as well as all River LINE light rail vehicles on Thursday, February 8th. This policy will be strictly enforced. As a reminder, all beverages, including alcohol, are not permitted on NJ TRANSIT buses at any time regardless of event. Customers are reminded to remain vigilant for any suspicious activity while on the NJ TRANSIT system. If you see something, say something. To call in a tip, dial 1-888-TIPS-NJT or text a tip to NJTPD (65873). Note: Customers are advised that SEPTA will have limited service between Trenton and Philadelphia 30th St. station. This includes NO SERVICE FROM TRENTON AFTER 7:14 A.M.
Coach USA is planning to operate special service from points around New Jersey to Philadelphia. Visit https://coachusa.busbetter.net/eagles/bas for more information. -Ticketing: Purchase round-trip tickets at the start of your trip to speed your return by avoiding lines at Ticket Vending Machines (TVMs) and use the MyTix feature of the NJ TRANSIT mobile app, which is available for free download on any web-enabled iOS or Android device, to make the purchase even easier. To make a purchase, customers simply install the app and then create an account, which will securely save a customer's profile information and purchase history for ease of use. -Check Schedules in Advance: Plan your trip online to familiarize yourself with available trains and buses. -Allow Extra Travel Time and Travel Early: Traffic congestion during the parade may affect bus travel times to and from Philadelphia, so customers should plan accordingly. -Be patient: Customers should expect crowded conditions on trains, buses and light rail vehicles as well as on platforms and in stations. -Non-parade customers: Regular weekday customers NOT attending the parade are encouraged to adjust their travel plans to before or after the festivities if possible. -Station announcements: Customers should listen to announcements at stations and from crew members for any travel changes. Luggage: Travel as light as possible. Customers should check with the event for regulations on what size bags are admissible. -Social media: Stay connected through Facebook, Twitter, Instagram and YouTube. Search for rail, bus or light rail-specific Twitter accounts for the best information.